Thanks for coming by and visiting me. 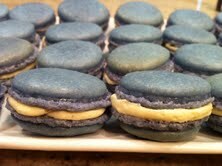 Aren’t macarons fun to make? And they taste so good! I don’t have any original ideas for flavors, right now I’m using a cookbook. Have fun! Thank you for stopping by too 🙂 Looking forward to more experimenting with macarons! I’ve actually never attempted to make macarons, so I would be interested if in the recipe post you included tips that you ahve learnt along the way to make them pretty fool proof haha. ALready these actually look fantastic- super impressed here.